Glendale /ˈɡlɛndeɪl/ is a city in Los Angeles County, California, United States. Its estimated 2014 population was 200,167, making it the third-largest city in Los Angeles County and the 23rd-largest city in California. 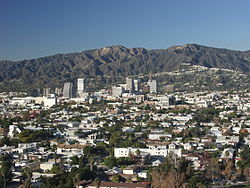 Glendale lies at the eastern end of the San Fernando Valley, bisected by the Verdugo Mountains, and is a suburb in the Greater Los Angeles Area. The city is bordered to the northwest by the Sun Valley and Tujunga neighborhoods of Los Angeles; to the northeast by La Cañada Flintridge and the unincorporated area of La Crescenta; to the west by Burbank and Griffith Park; to the east by Eagle Rock and Pasadena; to the south by the Atwater Village neighborhood of Los Angeles; and to the southeast by Glassell Park neighborhood of Los Angeles. The Golden State, Ventura, Glendale, and Foothill freeways run through the city. Glendale has one of the largest communities of Armenian descent in the United States. In 2013, Glendale was named LA’s Neighborhood of the Year by the readers and editors of Curbed.com. Forest Lawn Memorial Park Cemetery contains the remains of many noted celebrities and local residents. Grand Central Airport was the departure point for the first commercial west-to-east transcontinental flight flown by Charles Lindbergh.